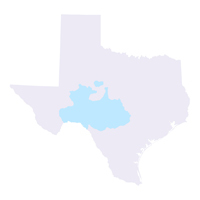 The Edwards Plateau region comprises an area of central Texas commonly known as the Texas Hill Country. It is a land of many springs, stony hills, and steep canyons. The region is home to a whole host of rare plants and animals found nowhere else on earth. The limestone of the Edward's Plateau is honeycombed with thousands of caves. Beneath the eastern edge of the Plateau lies a hidden world of underground lakes known as the Edwards Aquifer. This precious water resource also is home to a number of curious creatures, such as the blind salamander. Today, the Edwards Plateau is characterized by grasslands, juniper/oak woodlands, and plateau live oak or mesquite savannah. Open grasslands and savannahs were more common in presettlement times than they are today. Ranching is the primary agricultural industry in the region. These plants have been identified as particularly worrisome terrestrial invasive species in the Edwards Plateau ecoregion. Click on their scientific names to go to the Invasive Plant Database and learn more.